This is the third post in a series from my recent trip to Israel. Here are links to the first post, “Five Smooth Stones”, and second post, “Lessons From a Shepherd”. Everywhere you go in Jerusalem there are walls. From beautiful stone walls meticulously laid thousands of years ago to mangled razor and barbed wire walls thrown up in anger. Much could be said about these walls. Mention the term and you will likely find yourself in a heated discussion. Some would credit the recent construction of walls with stopping suicide bombers, while others would point to these same walls as evidence of oppression. One of the most significant walls in the world is in Jerusalem. The 3,000 year old Western Wall is the only remaining structure from the Jewish Temple. Stretching a mere 187 feet, this wall serves as a constant reminder to the Jewish people that they are fragmented, scattered and (seemingly) still without their promised Messiah. The cracks in this wall contain the written prayers of thousands. Night and day, prayer warriors storm the gates of heaven from the base of this wall. Walls have always been a major part of Jerusalem’s history. 2500 years ago Isaiah prophesied about men who would be placed on these walls, men who would be in constant intercession on behalf of Jerusalem. On Your Walls, O Jerusalem from Iron Kite on Vimeo. One other thing I learned about shepherds. A shepherd will only lead his sheep along the mountain top just long enough to take them to the next valley. The valley is where the water and grass are, not the mountain top. If we apply that analogy to us as the Lord’s “sheep”, we can take comfort as we are led down to our valleys. It is there where the Shepherd knows we will find life. The mountain tops are nice, but we can’t survive on them. We must come down to the valley for nourishment. 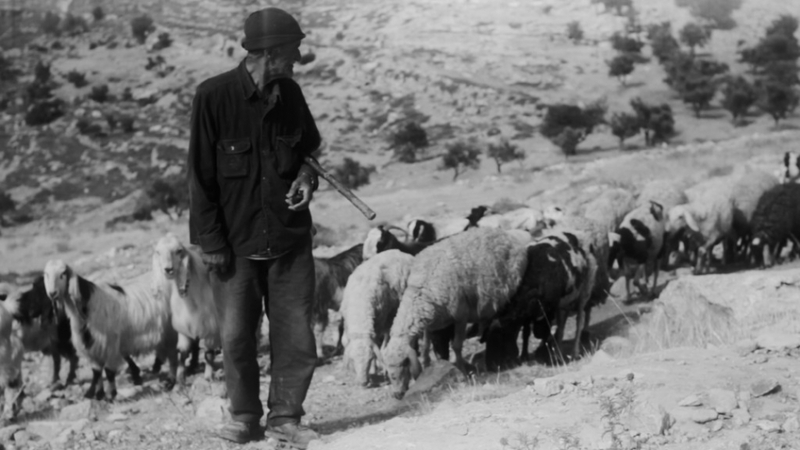 And the grooves worn down by sheep on the sides of mountains in Israel…they are called paths of righteousness. May the Good Shepherd lead you today. Lessons From a Shepherd from Iron Kite on Vimeo. As expected, Israel was INCREDIBLE. I’ll be posting a full length film in a few weeks, but until then we will be using some of the footage for the next few “Humbled By…” posts. But then I remembered why David was the one who said, “Let no man’s heart fail on account of him; your servant will go and fight this Philistine” (1 Sam 17:32). David knew that the Lord would deliver him “from the hand of this Philistine”. So this week’s “Humbled By…” post is a reminder that whatever “Goliath” we face, if we put our trust in the strength of the Lord, we will prevail. As I stood there in the Valley of Elah, I realized that nothing I come up against could ever compare to a 9-foot warrior setting his sights on tearing me apart. I prayed to receive the faith of young David, who knew that even though he selected five smooth stones from the brook, it was God Almighty who fought the battle for him. As I was about to walk out the door to catch my flight, I thought it might be a good idea to let everyone know that there won’t be a “Humbled By…” post today or next week :( The good news is, we will have some SWEET stuff to show you in a few weeks from Israel…the bad news is you have to wait a few weeks. Don’t worry, we’ll be sure to share some stories and hopefully introduce you to some new people from another part of the globe. Until then, here are some of the older “Humbled By…” posts to enjoy. In Ephesians 3:14-19, Paul writes a specific prayer that he has for his young church. He prays that they would know “how wide and long and high and deep is the love of Christ, and to know this love THAT SURPASSES KNOWLEDGE”. Know a love that surpasses knowledge? Wow. Until Lindsey and I had Layla, my understanding of “love” was very limited and small. Now, we have two little girls and there are times when my heart just can’t contain the amount of love I feel for my three incredible girls. This love is real and powerful, yet it pales in comparison to the love that God has for them. Just like Paul, I want them to know that love…both from me and from God.